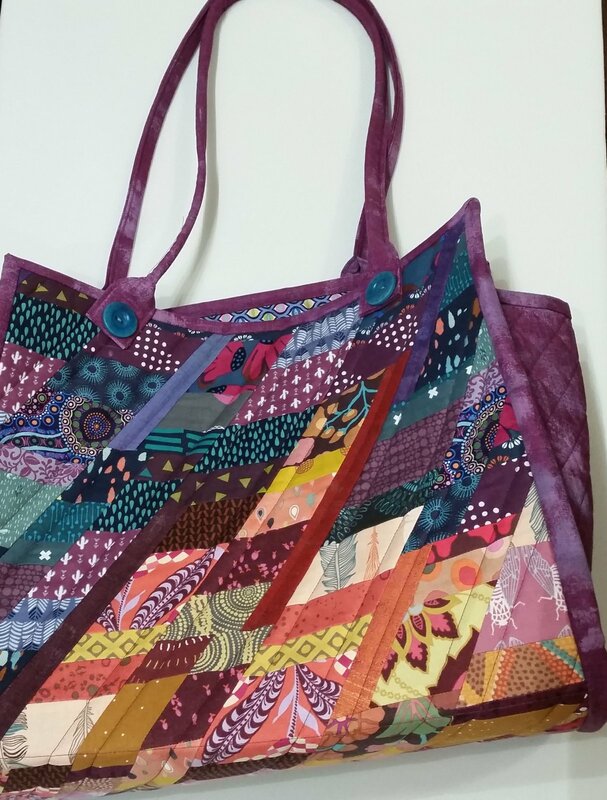 In this class, we construct a colorful panel that gets turned into a fantastic tote bag. The simple piecing techniques for the panel will allow you to focus on color and fabric selection rather than difficult assembly. The bag itself is simple to construct and as always, Mary has made construction changes to make it incredibly easy. Fabric per the pattern instructions. For the colorful panel, you will want a variety of fabrics. The shop sample was made from about 20 assorted warm-colored fabrics and about 20 assorted cool-colored fabrics, but fewer fabrics would also work great. You will want to cut narrow strips of assorted widths that are 22” in length (this is the length of a fat quarter). Jelly rolls would work great for this project. Sewing machine with all the usual supplies, especially a quarter inch foot. If you have a walking foot, bring that too! I recommend a size 80 needle for constructing the panels and a size 90 needle for assembling the bag. For thread, I recommend Aurifil for piecing – some of the stitching will show so pick a color that either doesn’t show at all or looks really pretty! In the picture, I sewed with bright turquoise thread. Pre-class preparation: None. The first day (all day class), we will make the colorful panel. On the 2nd class day (1/2 day), we will assemble the tote. You will have a few things to complete between the classes – if you don’t have time to complete the homework, you will still get to see all the steps to assemble the bag!